As supporters of the President have argued, based on the context, the President may have been limiting his comments to individuals believed to be part of MS-13, a gang operating in the U.S. and parts of Central America, and long a rhetorical point of attack for the President. The President’s comments came in response to remarks from Fresno County Sheriff Margaret Mims, who was expressing challenges faced by sheriffs in California. Mims framed these challenges in terms of conflicting local, state, and federal laws and directives. These conflicts include questions over what level of cooperation is acceptable between local law enforcement and ICE (Immigration and Customs Enforcement). 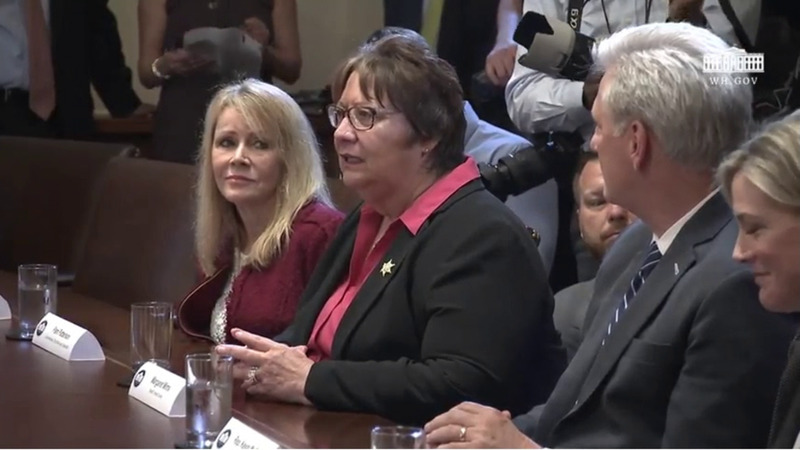 In calmly explaining the challenges she and other sheriffs face, Mims stated, “There could be an MS-13 member I know about–if they don’t reach a certain threshold, I cannot tell ICE about it.” It was in response to this comment that the President launched into his statement quoted above. Thus, it is possible to see this as the President condemning the brutality he often links to MS-13. However, it is not clear from the President’s own words that he intended his remarks to be limited to MS-13 members. The president said “people coming into the country,” not MS-13 gang members. He stated that “we’re stopping a lot of them,” again using a vague, broad pronoun to refer to a group of people that is not necessarily limited to MS-13. Given how often ICE detains American citizens, and for how long, it is not clear from the President’s remarks and actions that his intent is a narrow critique of a violent gang. It is important to also note that this President has frequently used language that suggests he views nearly all immigrants as criminals. More importantly, however, it does not matter if the President was speaking narrowly. His rhetoric is dehumanizing and dangerous. While not all dehumanizing rhetoric has given way to genocide, genocide—and plenty of oppressive policies that fall short of genocide— is nearly always proceeded by dehumanizing rhetoric. Further, linguistically linking all migrants with criminals suggests that all migrants are criminals, and that migrants commit crimes at a high rate. Statistics do not back up these claims, but that does not stop some people from believing them. As social discourse shifts to further acceptance of depictions of immigrants as criminals and animals, it becomes easier for people to turn a blind eye to violence against immigrants. It also makes it easier to support calls for restrictions on the number of documented migrants and refugees allowed into the U.S.
All of these elements reflect one of the central challenges of human rights: fully accepting that everyone is human, and everyone has rights. This means that both victims of atrocities, and the perpetrators of them, are human and deserve full protection of their rights. When we lose sight of this, we make it easier to justify violations of any person’s rights (as long as enough people agree that they are not deserving of rights). This often gives way to further violations. The key characteristic of human rights is that they are universally held by all humans, not just those we deem worthy or deserving. The concept of human rights challenges us all to accept the humanity of every single person. Because once one person’s rights can be taken away, anyone’s can. It is imperative that we do better and never lose sight of our shared humanity. It is critical that politicians, above all else, understand this and try to fulfill our obligations to one another. Regardless of the context or the intent of the President’s remarks, dehumanizing statements are dangerous and deserve to be labeled accordingly. Daniel Tagliarina is Assistant Professor and Pre-Law Advisor at Utica College. Corinne Tagliarina is Adjunct Professor of Human Rights Advocacy at Utica College.